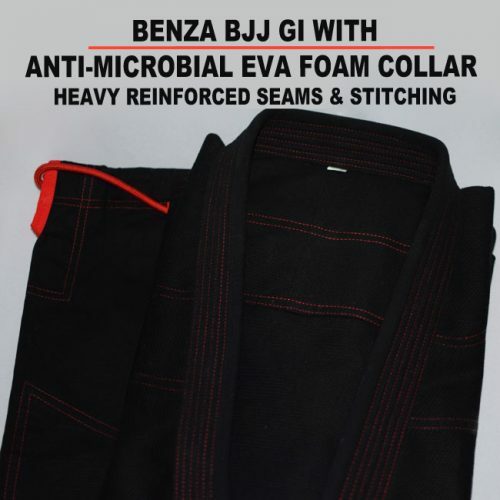 BENZA SPORTS proudly presents our competition proforce Brazilian Jiu-Jitsu Kimono (Black). Featuring our 650gr/med light Pearl Weave Jacket, One piece jacket design with no back seam. With the addition of unique black Benza woven ribbon and color trims. New 12oz Plain Weave (100% Cotton Canvas) pants that is light while highly durable and strong. Also featuring our cross stitched reinforced knee areas. Designed to meet the durability and strength expected by today’s Brazilian Jiu-Jitsu fighters.